Pre-Owned GMC Conversion Vans are a great value for someone who needs a conversion van, but cannot justify the expense involved with purchasing a brand new one. Paul Sherry keeps a rotating inventory of various pre-owned GMC and Ford models, which typically run at a fraction the price of one of their newer counterparts. The lower price tag is no indication of poor quality or reduced features. Many of these GMC vans are equipped with similar body kits, entertainment features, and premium luxury features that you would expect to find on a newer model. High quality leather interiors, premium carpeting, and wide ranging lighting options serve to accent the luxury of these conversion vans. 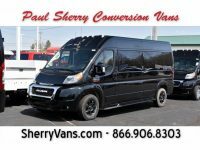 If you are looking for a high quality conversion van for a long trip, high passenger count, or simply to enjoy and have fun with, a Paul Sherry conversion van may be just the ticket for you. With a great lineup of premium GMC models, our dealership brings the luxury of a high end conversion van into the reach of the average buyer, without the necessity of breaking the bank to get it. Several models of GMC based conversion vans, such as the Explorer, Sherrod, Majestic, and Rocky Ridge can routinely be found in excellent pre-owned condition for reasonable prices. In addition to the products themselves, Paul Sherry Vans offers a range of services to make the buying process easier, including Financing options with a number of local, regional, and national banks. 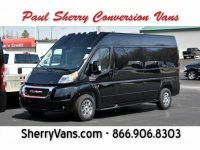 In addition, Paul Sherry offers Delivery to every state in the U.S, making arranging for transportation of your new conversion van a breeze. For the owner of a conversion van looking to upgrade, the dealership will also accept trade ins toward a newer model. With all of these options, they make the process of finding, purchasing, and accepting delivery of a luxury conversion van as easy and painless as possible.